Once you try this tasty cilantro and pecan pesto, you may never go back to the traditional basil variety again! This easy vegetarian recipe is great for busy weeknights, as it takes only as long to put together as cooking the pasta. This fresh-tasting pasta can be served warm for an easy dinner or lunch, or at room temperature to bring along to a potluck or picnic. Good-quality cherry tomatoes are available year-round, but during summertime you could also try chopped heirloom tomatoes for an amazing burst of flavor. Sprinkle the pasta with chopped fresh cilantro and grated Parmesan cheese for a finishing touch! 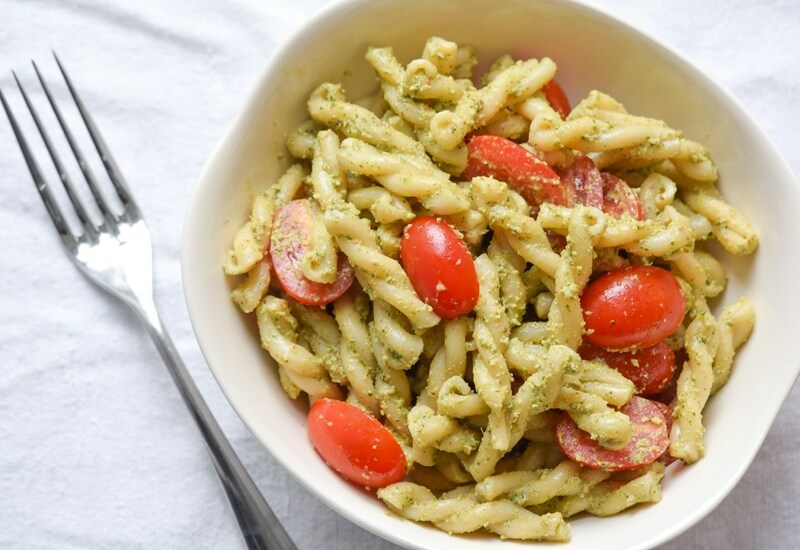 To make this pesto vegan, omit the Parmesan cheese and add a little more salt to taste. For a more filling pasta, add some protein. Sliced grilled chicken, flaky broiled salmon or quickly sautéed shrimp would all be delicious. Stir in a little more pesto to coat. Per Serving: 874 calories; 71g fat; 48.6g carbohydrates; 18g protein; 16mg cholesterol; 480mg sodium. I made this with spaghetti squash and my husband LOVED it. Very delicious and healthy. I also used red pepper instead of tomatoes and added a jalepenjo for a little kick. this is so good. I would make this again. pretty simple to whip up. I made a vegan pesto just for fun, not bad! I coated it really good in the sauce, and I am really pleased with the way it turned out. The cilantro pecan pesto was really different, but I liked it. I tossed in some grilled chicken, which made a good, hearty dinner. Added some large sautéed shrimp to this pasta and extra pesto too. I've been on a shrimp kick lately and it paired perfectly with this dish. Penne pasta worked well, I couldn't find the one pictured in this image.